Temperatures at 4,500 FT are around 37 Degrees in the Sandberg area in the I-5 corridor. Temperatures in Big Bear are 41 degrees. This is the layer of colder air I was talking about and it is still possible to get some ice at the 5,000-6,000 FT level today with this odd low level colder layer where above 7,000 FT it is warmer than at 5,000 FT. This is likely in part due to the drier air caused by the winds in the area being southeast to northwest (‘offshore’) and not off the ocean. The wind was taken care of in previous articles mentioning this will have downed poles and trees and so it is happening in the Vandenberg/SLO/Kern County areas as we speak. The flooding will begin to take hold from Santa Barbara south and eastward as we speak. A very strong low-level jet will up the precipitation risk across the flood zones starting early Thursday morning. This will increase as the day moves along with additional strong low-level jet influences coming in along with a strong tropical moisture plume. This plume will impact between 4 am Thursday morning and around 4 pm on Thursday early evening. This will be a very dangerous flood event in a short period of time and as I stated in previous articles… you should have prepared and made your plans well in advance. Less accumulation is expected in the LA Basin, SCV, Ventura County, and Santa Barbara areas due to being on the western edge of the main moisture plume. You can get away with 1-2″ of rainfall from this event. Same can be said for the rest of the advisory areas, the exception in Palm Springs you could exceed 3 inches. 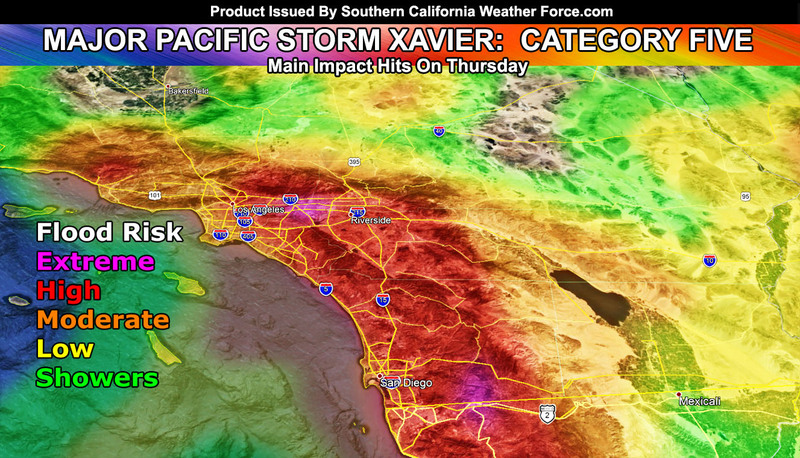 Widespread 3-6″ rainfall marks will be expected in the warning area, especially Orange, The Inland Empire, and the San Diego zones. Over 7+ inches will be expected on the south and western slopes of the San Bernardino, Riverside, and San Diego Mountains as well. Heavy rainfall is expected to bring flood yet again as far as the Morongo Valley areas and even the Western Imperial County zones. Damaging winds are expected with 40-45 mph wind gusts as an average for the region on Thursday and 60-80 mph gusts in the mountain regions, with 60 mph expected in the Cajon Pass. Downed poles and trees are likely once again so be cautious out there. The snow level is expected to drop below 7,000 FT near the end of the system. I will update the snow forecast products and issue advisories if needed over the day on Thursday. Expecting another round to go through the region on Friday for continued showers with a snow-level of 5,000 FT.
Over the weekend another system drops in. This one looks cold, similar to Pacific Storm Warren last week where snow levels went below 3,000 FT. Will update on that after Major Pacific Storm XAVIER passes.